Fiction – paperback; Biblioasis; 300 pages; 2015. Translated from the French by Donald Winkler. 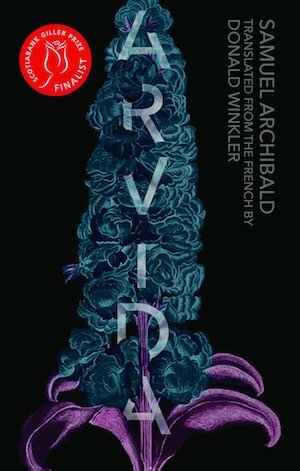 I would not normally describe myself as a short story fan — my preference is usually for novels or novellas — so it came as somewhat of a surprise that I enjoyed Samuel Archibald’s Giller Prize shortlisted Arvida so much. In fact, I championed this one to win the Shadow Giller Prize, when the jury cast their votes on Friday, because there was something about this volume, a glorious mix of ghost stories, road stories, family tales and rural folklore, that really grabbed me. It may have been the fact that pretty much all of the stories — there are 14 in all — have a distinctly Canadian feel (many are set in the author’s home town of Arvida in Quebec) and that they were written in such an immediate style (by which I mean they transport the reader effortlessly to times and places that feel so real you could touch them). Or perhaps it’s just that having read a string of rather so-so books on the Giller shortlist ( with one exception, that being Martin John, which we have selected as our Shadow Giller winner), I was waiting for one that had the “wow” factor. It just turned out that this was the last one on my reading list, proving that the saying “last but by no means least” is, indeed, true. Each story in the collection, expertly translated from the French by the Donald Winkler, is rounded and complete, drawing you into a world which is sometimes fantastical (in A Mirror in the Mirror a woman wastes away in a lonely house waiting for her husband to return from Montreal, where he has gone to “chase his artistic ambitions”); sometimes scarily surreal (Jigai, the only story set outside of Canada, is about ritual mutilation between Japanese women); and sometimes downright tawdry (in América, two losers foolishly agree to smuggle a Costa Rican women across the border into the US just after the 9/11 attacks when border control is on high alert). It also features two series of interlinked stories — Blood Sisters I, II and III, about one family’s secret history, and Arvida I, II and III, which all begin with the words: “My grandmother, mother of my father, always said”, which have the ring of autobiography about them. The final story, Madeleines, draws on the idea that Proust’s entire In Search of Lost Time begins with a man remembering his whole childhood by merely tasting a little cake, but for the author, who wants to be a writer but does not know how — “the only story that comes back to me from taking a bite of something has to do with a mouthful of McNugget” — this seems like an impossible task. And yet in writing this story, of how it is difficult to write stories, he has written one that shows how stories are all around us if we care to look. And in writing this particular tale, he shows in a deceptively clever way, how the entire volume of Arvida came into being. Reading it made all the pennies of the previous 200 or so pages fall into place for me, and I came to the last page only wanting to turn right back to the start to read it all over again. If that’s not the sign of a good book, I’m not sure what is. Unsurprisingly, Arvida has already won a literary prize — the Prix Coup de Coeur Renaud-Bray in 2012 — and on Tuesday we will find out whether it takes the 2015 Giller Prize as well. If it does, it will be the first translated work to win the award. For another take on this collection please see Roughghosts’ excellent review. I enjoyed your review, Kim – your enthusiasm for these stories has made me think about them in a more favourable light. I did like this collection, or at least I liked a good bit of it. ‘House Bound’ was my favourite too (really excellent) and I also liked ‘Cryptozoology’, though I found ‘Jigai’ just plain disturbing. I also enjoyed the three ‘Arvida’ stories, which reminded me a lot of Roch Carrier. The three ‘Blood Sisters’ stories I didn’t like at all, mainly because they started strongly and then became increasingly opaque and dreamlike and reminded me why I’m generally averse to “adult fairy tales” (an aversion that Heather O’Neill’s ‘Daydreams of Angels’ and Patrick DeWitt’s ‘Undermajordomo Minor’ had just gone some way to overturning). I did enjoy the other two collections on the longlist slightly more (though O’Neill’s would have benefitted from being slimmer and thus avoiding some repetition), but Archibald’s book certainly has a unique flavour and I’m glad the Giller prompted me to read it, which I perhaps wouldn’t otherwise have done. Cheers, David. I had high hopes that this one might win the prize, given it’s so distinctively Canadian (compared with the rest on the shortlist) but alas it didn’t take the gong. But I still think it’s an impressive achievement. I would easily read this one again, I enjoyed it that much.